Inside Angoon Trading Company, some of the shelves are starting to look bare. The potato chips are still well-stocked, but there’s only a few boxes of Ho Hos and Twinkies. Albert Howard, Angoon’s mayor, says he’s concerned about the lack of ferry service because it means limited choices at the grocery store. “It’s not what we’re normally used to when we go to a store. There’s not much of a selection of anything,” Howard said. To make things worse, a high concentration of mercury was recently found in a seal hunted for subsistence. The discovery has sparked concerns among residents about the safety of some local subsistence foods. For the things you can’t get from the water or the land, you come here: laundry detergent, sugar, rice, canned goods and yes — the sweet, spongy delicacy of a Hostess cupcake. Another Albert, Albert Kookesh III, is missing cold treats. Storeowners, Shayne and Sue Thompson, say perishable items have been the hardest to keep in stock. 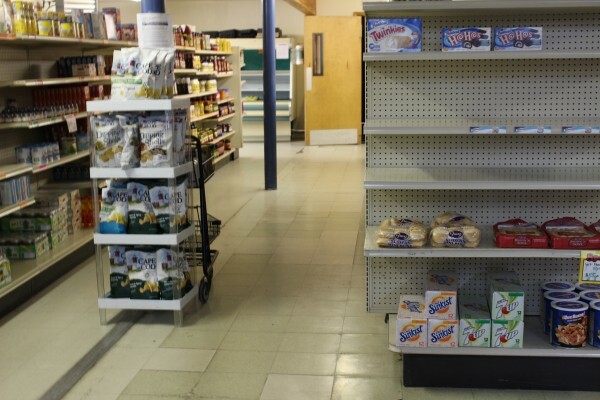 Although the LeConte is back online now, it had been about five weeks since the ferry’s last visit — five weeks since they received their regular shipment of groceries. During the hiatus, they flew to Juneau to get fresh food. “Shayne and I had been in town for a week, so we picked up a bunch of fresh produce for the store and brought it over in our luggage … (and) now we’re down to the wire,” Sue Thompson said. It costs $1.10 a pound to bring things over on Alaska Seaplanes. “A gallon of milk weighing 8 pounds coming from Seattle? Normally, we’ve got it cut down as much as we can, but if we have to fly that over a dollar a pound? It’d be close to $15 to $18 depending, and that’s ridiculous for milk!” Sue Thompson said. The Thompsons are proud to say they haven’t raised their prices yet. They knew the LeConte’s service gap would be temporary. But with proposed state cuts to the ferry system, reduced service to Angoon could become a reality. 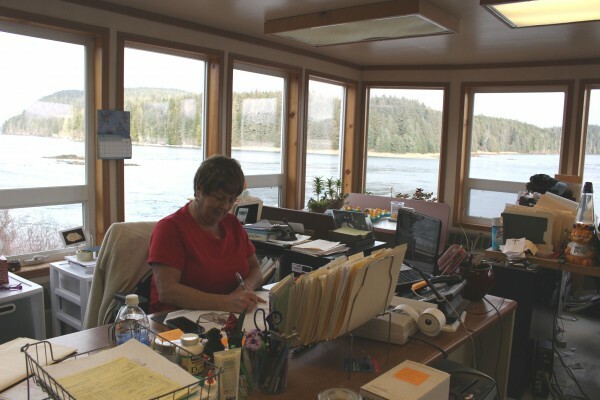 In 2010, Angoon’s ferry terminal received a $1.6 million upgrade. It was rebuilt to accommodate the fast ferries, which only run in the summer. Angoon relies on the LeConte year-round. The ferry also visits the communities of Tenakee Springs, Pelican and others farther away, but the LeConte needed maintenance this winter. Typically another ferry would take its place. “… (but) due to budget reductions we’ve had to take a couple of ferries offline,” said Jeremy Woodrow, a representative for the Department of Transportation. The Alaska Marine Line fleet has 11 vessels, and Woodrow compares a ferry overhaul to getting a tuneup on your car. Unfortunately, in this scenario, there’s no sporty rental option with a new car smell. “We do the best we can with the budget we’re given. It really depends on what those limitations are and how we can schedule our ferries,” Woodrow said. The budget for the Alaska Marine Highway System recently went through one round in the legislative process and came out with no changes to Gov. Walker’s proposed cuts. But it still has a way to go. Albert Kookesh III hopes the cuts won’t be deeper. He says the ability to travel outside of Angoon is important. Flying to Juneau with a family of five could cost as much as $700 one way. The ferry is his — and many other small communities’ — lifeline to the outside world. When the LeConte finally did arrive in mid-February, it carried boxes of groceries. So, Kookesh and his kids went to the store and bought Popsicles.